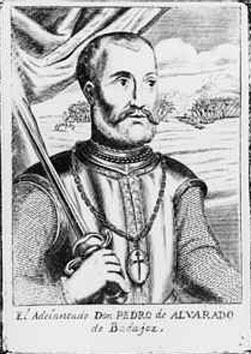 One of the Spanish leaders in the discovery and conquest of America, born at Badajoz about 1495. He held a command in the expedition sent from Cuba against Yucatan in the spring of 1518, and returned in a few months, bearing reports of the wealth and splendour of Montezuma's empire. In February 1519 he accompanied Hernando Cortes in the expedition for the conquest of Mexico, being appointed to the command of one of the eleven vessels of the fleet. He acted as Cortes's principal officer, and on the first occupation of the city of Mexico was left there in charge. When the Spaniards had temporarily to retire before the Mexican uprising, Alvarado led the rear-guard (1st of July 1520), and the Salto de Alvarado -- a long leap with the use of his spear, by which he saved his life -- became famous. He was engaged (1523-24) in the conquest of Guatemala, of which he was subsequently appointed governor by Charles V. In 1534 he attempted to bring the province of Quito under his power, but had to content himself with the exaction of a pecuniary indemnity for the expenses of the expedition. During a visit to Spain, three years later, he had the governorship of Honduras conferred upon him in addition to that of Guatemala. He died in Guatemala in 1541.